Calculate the number of people that you expect at your event. This would include all of the people actively taking part of the the event, excluding those that would be serving or attending. The event type is the greatest modifier of needed space. For cocktail parties and standing tables, calculate 3 sq. ft. per person. For a buffet or reception, 8 sq. ft. per person. A seated dinner can occupy up to 12 sq. ft. per person. Apart from the meal, are you going to want a stage, or a dance floor? These additional floor space items will need to be taken into account in order to pick the right tent for your needs. For smaller amounts of guests, either a Frame tent or a Structure tent would work. 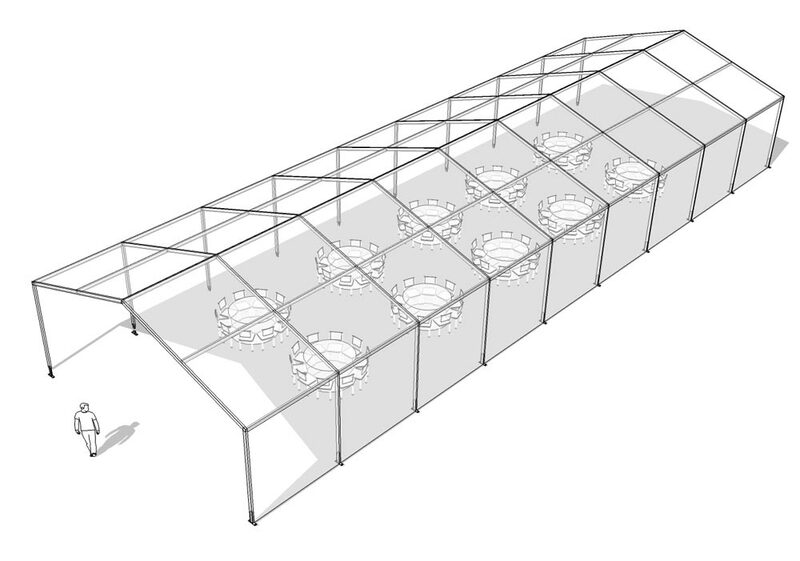 Because frame tents have a max width of 40 feet, a group of less than 100 would be able to easily fit inside of either structure. A larger guestlist requires some thought as to which tent would be needed. 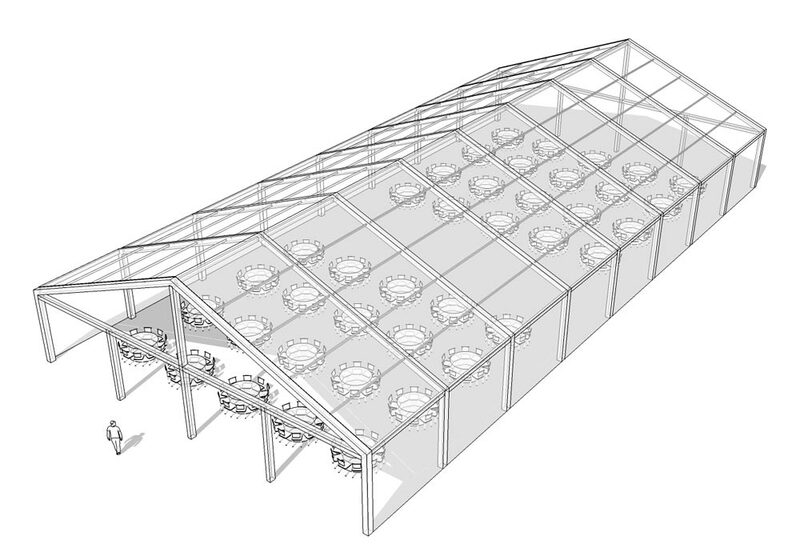 A structure tent can extend to a width of 66 feet, and can be as long as needed. If there is not much time to set up, a frame tent might be the ideal option. 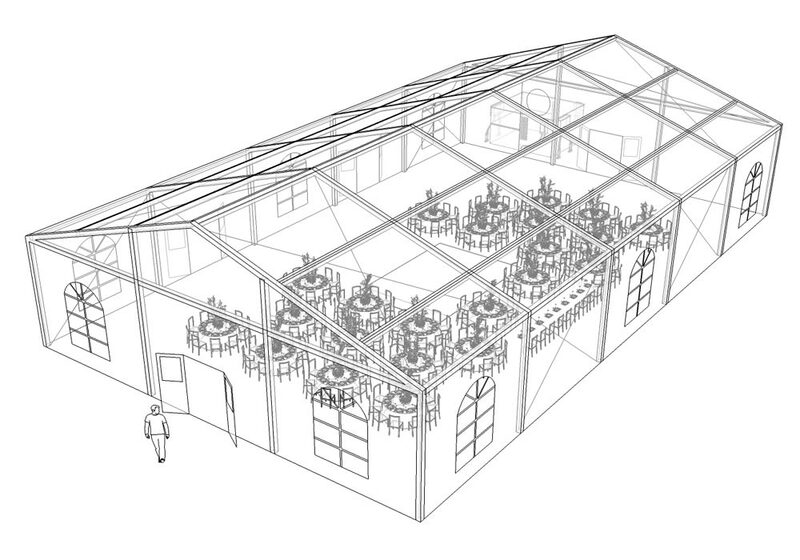 To be able to shelter a large amount of guests, a Structure tent will be needed. For a performance event, guests will be seated in rows, and as not much space would need to be dedicated to each individual guest. 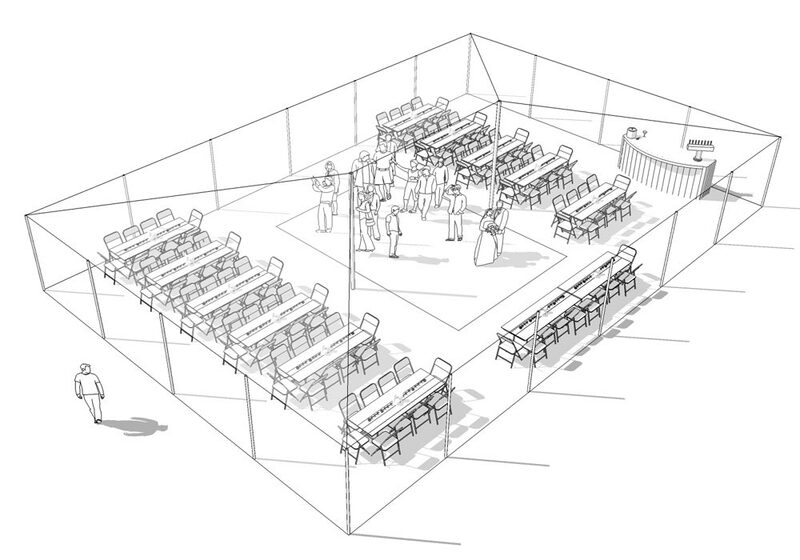 However, space would need to be considered for the performance space. If a full band is expected to play on a raised platform, at least 300 square feet would need to be dedicated to that. For a cocktail party, consider whether it will be standing or partial standing. Calculate 3-6 square feet per guest, in order to comfortably accommodate all guests. A sit-down meal brings in the variable of tables and table arrangements to the mix. For oblong or round tables, calculate 10-12 sq. ft. per guest in order to ensure a comfortable space for guests and waiters to move freely. How Much Additional Floor Space? Some events call for a separate lounge/reception area, apart from the dining space. The space should be at least as large as the dining area if everyone were expected to stay for an extended period of time. If it is meant to be a through-space, it can be smaller. 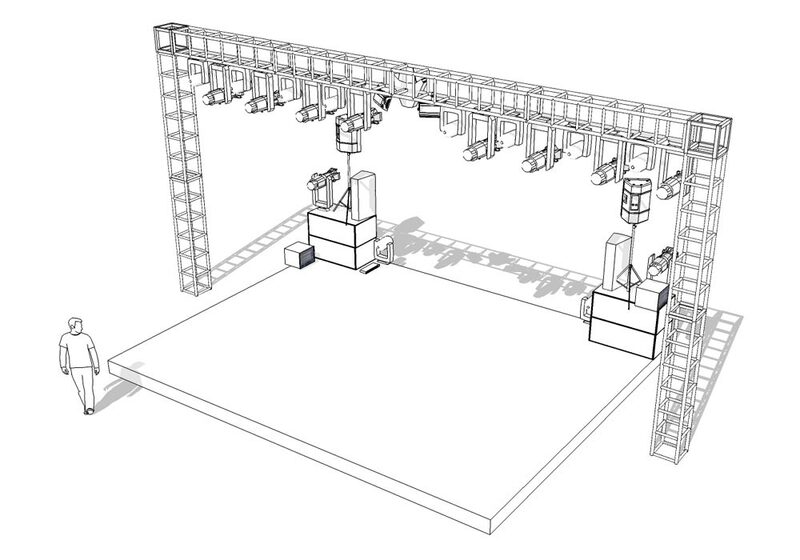 For events requiring stages, careful attention should be paid to the type of performance. A standard quartet or band would probably not need more than the basics, but a "big band" would need, apart from a reinforced stage, a large amount of floor space to accommodate all members, as well as space for a speaker. Will the tent be needed for hours, days, weeks or months? Structure tents are better suited for long-term installations, since they can withstand all kinds of weather situations. Will weather be an issue?